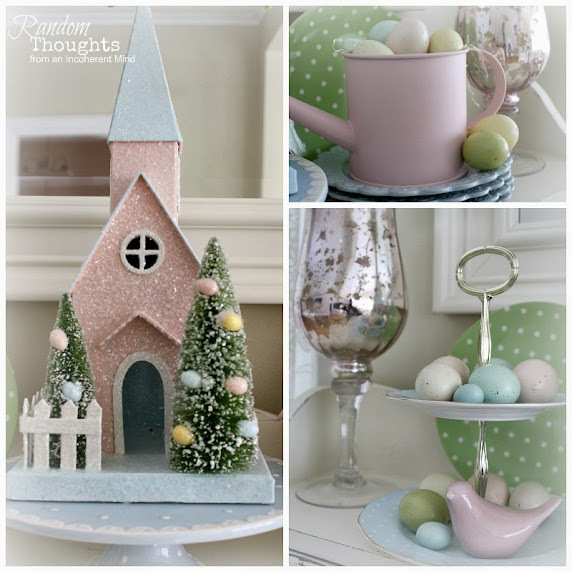 I wanted to share a little Spring/Easter decor today. I feel like I am always sharing my dining room hutch with you. I hope I'm not boring you with it. I didn't use anything new here at all. I just put a lot of what I had together, but in a different way. seeing what you can do differently with what you already have. I just kept everything to a soft Spring-like palette. How I love those pink Mercury glass hurricanes! Gina, I adore your dining room hutch. 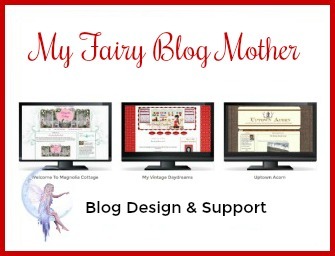 I never tire of seeing it decorated because you have such wonderful ideas! I love your choice of pastels- so pretty! Very sweet spring collections. Love the little house. Happy Spring Gina. Your Easter decor is so pretty. 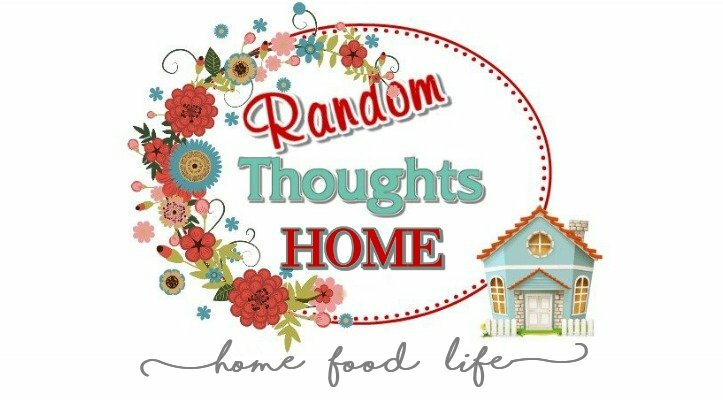 Love your white hutch and all the pretty items you have ! You must have quite the storage cupboard with your dishes etc! Would be fun to come shopping in your cupboards!! Have a wonderful spring day...light snow here today, but it is not staying on the ground which is good!! Very sweet and pretty, never tire of seeing your hutch!!! I think it looks lovely! Using what you have is certainly less expensive isn't it? :) LOVE the church! Bored.... NEVER! I think your dining room hutch looks adorable. I love the spring looking church and the colors you put together are perfect. Happy Spring.. it'll soon be Easter, can you believe it? Always so sweet. I love the fact that you decorate your hutch for different seasons. Hi Gina, your decorations could never be boring! 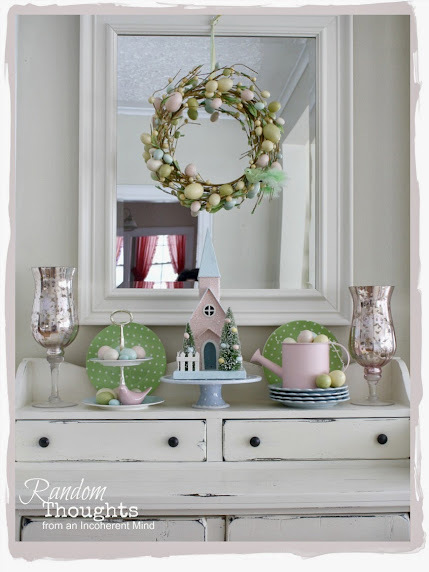 I love seeing how you change your hutch with the seasons. This one is so sweet. I love the soft Spring colors and those mercury class hurricanes are awesome! So glad that Spring has finally arrived! Never tired of seeing your hutch! What a beautiful Spring display! 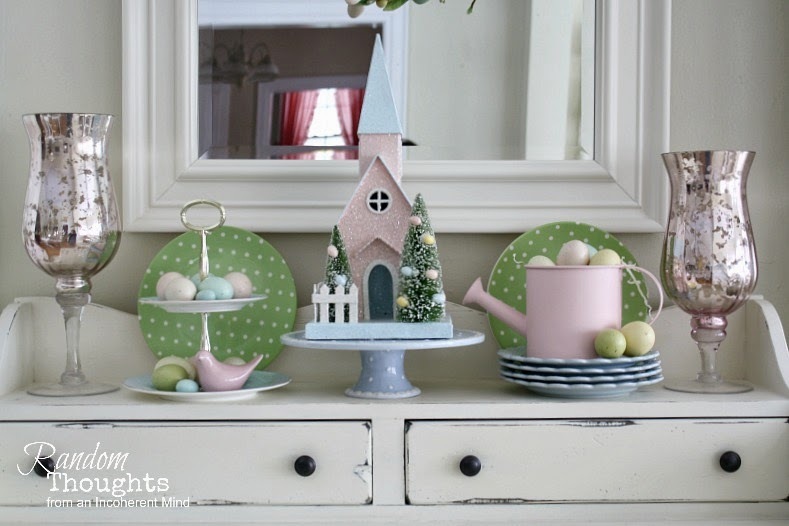 I always love to see how you've decorated your pretty hutch. What a sweet Spring vignette, Gina.